Welson (centre) wins gold in the 1500m freestyle final at the New South Wales State Open Championships at the Sydney Olympic Park Aquatic Centre on Sunday. Australians Joshua Parrish (left) and Tristan Bullen bagged the silver and bronze respectively. KUCHING: The Sydney Olympic Park Aquatic Centre has proven to be a happy hunting ground for Malaysian swimming star Welson Sim. Rio Olympian Welson, who is undergoing a training stint at the Melbourne Vic Centre in Australia, competed in a star-studded field comprising some of Australia’s best, to bag two silver medals and one gold at the New South Wales State Open Championships from March 15-17. On Friday, the Sarawakian broke the Malaysian record clocking 3:49.29 in the 400m freestyle and bagged the first of his silver medals. Upcoming 18-year-old Australian Elijah Winnington took the gold in a time of 3:48.68. Welson followed this up on Saturday when he lined up with several former Olympians in the 200m freestyle final. Welson, who went into the final as the fastest qualifier, swam a time of 1:48.04. This put him on the podium in second place behind Australian Rio Olympic’s 100m gold medalist Kyle Chalmers, who clocked 1:47.45. 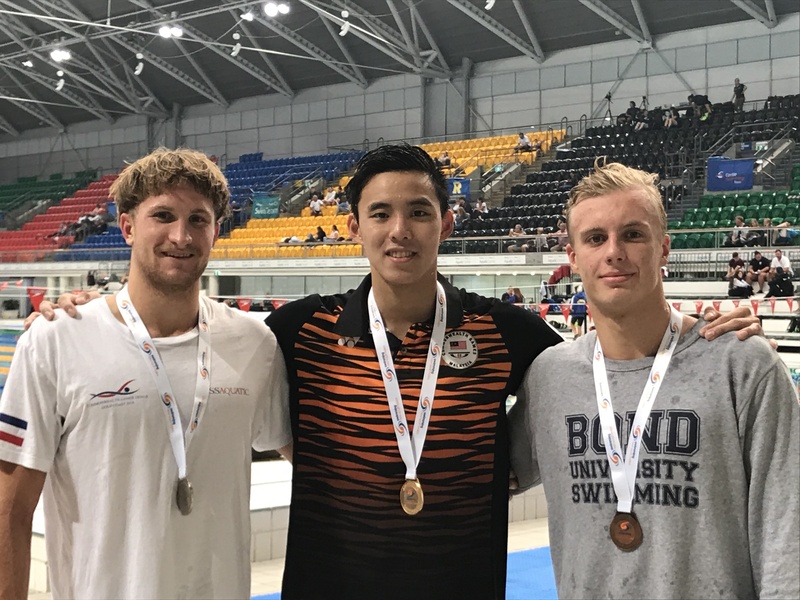 Kuching-born Welson left in his wake big names and Olympic medallists like Cameron McEvoy and current training mate Mack Horton. On the final night of competition, he struck gold, winning the grueling 1500m freestyle in a personal best of 15:29.76. Welson opened up a sizeable gap early on in the 30-lap race and held off a couple of surges from his rivals to win by a comfortable margin. While thrilled to get the gold, the ever humble Welson said he was still not satisfied and hoped to have another shot at breaking the national record of 15:23.61 held by double Olympian Jeffrey Ong, who set the mark way back in 1991. Welson, 21, holds the national records in the 100, 200, 400 and 800m freestyle events and has established himself as the country’s premier middle and long distance freestyler. He will now turn his focus to the Malaysian nationals next month with his longer term sights set on the 18th Fina World Aquatics Championships in Gwangju, South Korea from July 12-28. Welson breaks national 400m freestyle record 0 out of 5 based on 0 ratings. 0 user reviews.